Boat covers and yacht tenders are important for protecting your vessels and your investment in them. Tender and boat covers care and cleaning is a crucial component of overall yacht maintenance. Mega Yacht Cleaning is one of South Florida`s top providers for thorough boat covers cleaning and care. We know how important your vessel is to you, so we treat it just as we would treat our own boats. Stains, water, and mildew that are found on your boat and tender covers will eventually make their way to the vessel below. There is nothing worse than having mildew or standing water drip down onto exterior upholstery. Proper boat covers cleaning and Tender covers care will make all the difference. Free pickup and delivery to your slip. We`ve been to just about every marina in South Florida and we will gladly come out to yours. We come on your schedule; we never make you wait around for us. Complete cleaning and care for your covers, including Sunbrella fabric cleaning. Free upfront estimates and a list of references so you know exactly what you are getting ahead of time. Mega Yacht Cleaning strives to provide top-notch customer service in addition to unbeatable yachts and boats cover care. Call us at (954) 448-8899 and order a pickup for your yacht`s dry cleaning needs today. Boat covers are so important for the protection of your boat, so don’t forget to clean, protect and preserve them. Boat covers are usually made of canvas or Sunbrella fabrics and are very resistant to rough weather conditions. 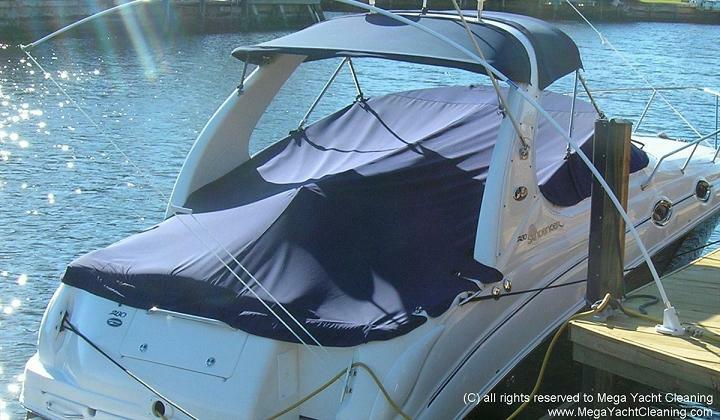 When exposed to the sun and rain on daily bases, boat covers tend to develop mildew stains and water marks. These mildew stain are often easy to be transferred from the boat cover to the exterior upholstery of your boat, and damage it permanently. To maintain your boat cover and upholstery in pristine condition it is recommended to wash your boat cover on yearly basis. To clean boat covers properly a big commercial washer is necessary as well as the proper laundry detergents. The staff at Mega Yacht Cleaning is so experienced in washing boat covers so insuring your satisfaction is part of our daily routine. Remember, boat cleaning is our job.